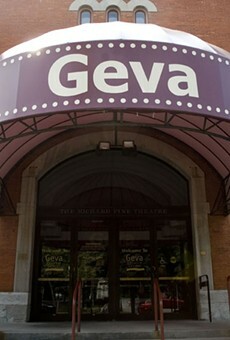 Geva Theatre Center announced its 2013-14 season on Tuesday night. The 41st season will include several world premieres and critically acclaimed dramas, and many shows with links to Rochester or Geva itself. Although the full summer 2013 season has yet to be announced, Geva Artistic Director Mark Cuddy closed his presentation by unveiling one of the shows. Rochester-area native and Academy Award nominee Robert Forster will star in "The Lifeguard: Ronald Reagan and His Story" June 13-30 in the GevaNextstage. This one-man show, written by David Rambo (TV's "Revolution") and directed by Mark Cuddy, will explore Reagan's presidency, including his dealings with Soviet President Mikhail Gorbachev. Writer Rambo worked with Reagan's daughter, Patti Davis, and was granted special access to Reagan's presidential library. The show is being developed with future tours in mind. The 2013-14 Mainstage season officially kicks off with the 30th anniversary production of the country-style musical "Pump Boys and Dinettes" (September 10-October 13). This will be the third production of "Pump Boys" at Geva, and the show has a local connection: former Rochesterian Cass Morgan is one of its writers, and was on hand Tuesday to announce its place in the line-up. Artistic Director Cuddy said that the show will have an interactive element, as theatergoers will be able to go on stage and get refreshments from the actual waitresses and attendants of the Double Cupp Diner. "The 39 Steps" (October 22-November 12) was initially a novel by John Buchan and then adapted into a film by Alfred Hitchcock. Years later the story of British spy Richard Hannay was adapted again for the stage, but in a very different way. The espionage thriller has now been turned into a slapstick comedy with four actors playing more than 150 characters. The show won the Olivier Award for Best New Comedy when it debuted in London in 2006. Starting 2014 will be "Last Gas," the world premiere of a new comedy by John Cariani, who wrote the recent Geva favorite "Almost, Maine." The show will run January 7-February 2, 2014. Another recent Geva production, "A Raisin in the Sun," was the inspiration for the Pulitzer, Tony, and Olivier award-winning drama "Clybourne Park." The play by Bruce Norris follows the house in a traditionally white neighborhood bought by African-African family The Youngers at the end of "Raisin." Fifty years later the house is sold again, but this time to a white couple looking to gentrify the neighborhood all over again. The show will run February 11-March 9, 2014. Also getting its world premiere on the Geva stage next season will be "Informed Consent" by Deborah Zoe Laufer (March 18-April 13). The play just received a script reading this week as part of Geva's Plays in Progress series and, judging by audience reactions at the season announcement, was well received. Inspired by true events, the drama follows a geneticist investigating why a Native American tribe is being devastated by diabetes. The answers bring into question the origins of the tribe and the beliefs of its people. Meanwhile, the scientist is grappling with the medical future of her own 4-year-old daughter. The 2013-14 concludes oddly -- literally and figuratively -- with a production of Neil Simon's "The Odd Couple" (April 22-May 8, 2014). The modern American classic comedy tells the story of what happens when fussy Felix is thrown out by his wife and forced to move in with slovenly divorcee Oscar, and has been adapted into TV shows, films, and even gender-swapped versions of the play. -Geva's official entry into the 2013 First Niagara Rochester Fringe Festival will be "All Your Questions Answered," the world premiere comedy by Greg Kotis (Tony-winning writer of "Urinetown: The Musical"). This will be a Geva Theatre Center Conservatory Production that features local college students, and will run in September. -Geva'sFestival of New Theatre will grace the Nextstage in October with a two-week showcase of new plays and projects currently in Geva's developmental process. -Two out of four shows were named for the 2014 Fielding Studio Series in the Nextstage. "Tinker to Evers to Chance" is another world premiere, this one a baseball play by Mat Smart concerning in part the infamous Game 6 of the 2003 NLCS. And Geva favorite BrigittMarkusfeld returns for Eric Coble's one-woman show "Stranded On Earth," about an artist fixated on the before and after of a life-defining moment. Subscriptions for the 2013-14 Mainstage Season are now sale, starting at $132. Nextstage subscription packages will go on sale in the spring. Tickets for "The Lifeguard" and "A Christmas Carol" will go on sale to subscribers on April 4 and May 1 respectively, and to the general public on May 1 (for "The Lifeguard") and in September (for "Christmas Carol"). For more information or to buy tickets call 585-244-4382 or visit the Geva website.